aFrom the Division of Neuroradiology (L.L.F.A, D.C.F., R.H.N., I.A.L., A.J.R. ), Faculdade de Ciências Médicas da Santa Casa de São Paulo, São Paulo, BrazilcDivision of Neuroradiology (D.C.F., R.H.N., A.J.R. ), Diagnósticos da América S.A. - DASA, São Paulo, BrazildDivision of Neuroradiology (D.C.F. ), Fleury S.A., São Paulo, Brazil. MATERIALS AND METHODS: MR imaging studies of 103 patients (170 examinations) were performed using a 1.5T scanner. Two neuroradiologists scrutinized signal abnormalities of the demyelinating plaques on gadolinium SWI and compared them with gadolinium T1 before and after an additional magnetization transfer pulse. Interrater agreement was evaluated among gadolinium T1 magnetization transfer contrast, gadolinium SWI, and gadolinium T1 spin-echo using the κ coefficient. The T1 magnetization transfer contrast sequence was adopted as the criterion standard in this cohort. Thus, the sensitivity, specificity, positive predictive value, and negative predictive value were calculated for gadolinium T1 spin-echo and gadolinium SWI sequences. RESULTS: Differences in BBB dysfunction were evident among gadolinium SWI, gadolinium T1 spin-echo, and gadolinium T1 magnetization transfer contrast. Gadolinium T1 magnetization transfer contrast demonstrated the highest number of active demyelinating plaques. Gadolinium SWI was highly correlated with gadolinium T1 magnetization transfer contrast in depicting acute demyelinating plaques (κ coefficient = 0.860; sensitivity = 0.837), and these techniques provided better performance compared with gadolinium T1 spin-echo (κ coefficient = 0.78; sensitivity = 0.645). CONCLUSIONS: Gadolinium SWI was able to better detect BBB dysfunction in MS plaques and had a better performance than gadolinium T1 spin-echo. Increasing SWI sequence applications in clinical practice can improve our knowledge of MS, likely allowing the addition of BBB dysfunction analysis to the striking findings of the previously reported central vein sign. Susceptibility-weighted imaging is a relatively new MR imaging technique that is currently being implemented in clinical practice in addition to conventional spin density and T1- and T2-weighted imaging methods, which are already used in commercially available MR imaging scanners. A number of studies have investigated a central vein inside white matter lesions, the “central vein sign,” detected by SWI or T2*-weighted magnitude images, as a promising imaging biomarker of inflammatory demyelination, adding MS specificity to the diagnosis.11 To standardize the evaluation of the central vein sign in the diagnosis of MS, the North American Imaging in Multiple Sclerosis group provided statements and recommendations.12 Although 7T has demonstrated the highest sensitivity for central vein detection,13 1.5T has also shown high rates of central vein sign detection.14 A finding of nonconfluent lesions 3 mm in length with 1 central vein has been demonstrated as a sensitive and specific discriminator of patients with relapsing-remitting MS from control subjects with benign white matter lesions. 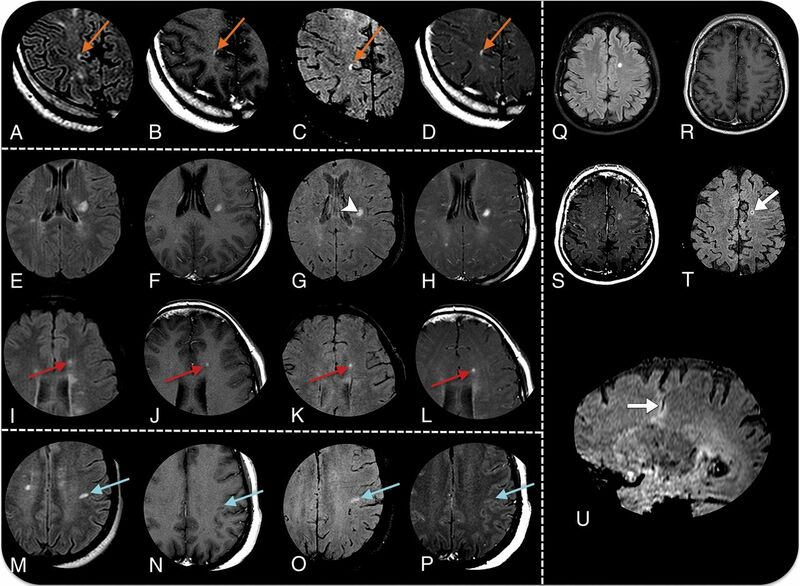 A study conducted by Hosseini et al13 also demonstrated a hypointense rim around MS lesions as an adjunct imaging biomarker for MS, which may be used with the central vein sign as a radiologic sign to differentiate benign from MS white matter lesions. The applicability of the T1-shinethrough effect might be pivotal for exploring the characteristics of Gd-based contrast agents on SWI, which primarily have a T1-shortening effect,17 without compromising the imaging of the normal brain.18 On the basis of this background, our study was designed to investigate the accuracy of the Gd-SWI sequence to detect BBB dysfunctions in MS plaques in the brain by comparing it with the performance of sequences that are currently used in clinical practice. The study was approved by an institutional review board of Santa Casa de São Paulo, and written informed consent was obtained from all participants. This study is an observational retrospective analysis of consecutive brain MR imaging examinations from a series of patients with a defined MS diagnosis. MR images were accessed through the digital archive of the institution and were acquired from December 2013 to December 2016. All patients had imaging findings indicative of MS according to the 2017 revised McDonald Criteria.5 Studies that did not fulfill the correct institution protocol, had poor-quality images that limited interpretation, had images with an alternative diagnosis that supported the symptoms, and had discrepancies in parameters that might affect the interpretation and comparison of images were all excluded from the study. All data were acquired on a 1.5T scanner (Achieva; Philips Healthcare, Best, the Netherlands) using a 16-channel sensitivity encoding neurovascular coil. Sagittal volumetric FLAIR images were acquired for brain lesion detection (slice thickness, 0.7 mm; FOV, 220 × 220 × 180 mm3; matrix, 184 × 184; TR/TE/TI, 7.000/263/2.300 ms; and acquisition time, 8 minutes and 31 seconds). Gd-SWI data were acquired with a flow-compensated 3D gradient-echo method (FOV, 220 × 189 × 150 mm3; matrix, 220 × 189; voxel size, 1.0 × 1.0 × 1.0 mm3; TR/TE, 23/33 ms; flip angle 10°; slice thickness, 1 mm; acquisition time, 3 minutes and 20 seconds). The 2D-T1 spin-echo (SE) sequence was acquired using the following parameters: 25 slices; slice thickness, 5 mm; FOV, 220 × 189 × 126 mm3; matrix, 244 × 168; TR/TE, 614/15 ms; acquisition time, 1 minute and 45 seconds. A comparative 2D-T1 SE sequence with an additional magnetization transfer contrast (MTC) on-resonance pulse (25 slices; slice thickness, 5 mm; gap, 0.5 mm; FOV, 220 × 200 × 137 mm3; matrix, 212 × 134; TR/TE, 600/12 ms; and acquisition time, 5 minutes and 26 seconds) was also obtained before and after intravenous administration of 0.1 mmol/kg of Gd (Gadovist [gadobutrol]; Bayer Schering Pharma, Berlin, Germany). The order of acquisition of the postcontrast sequences was uniform in all studies. The SWI sequence was acquired first, followed by the T1 SE, and finally, the T1 MTC. All images were assessed by 2 experienced neuroradiologists (A.J.d.R. and L.L.F.d.A.) with 18 and 25 years of neuroimaging experience who were blinded to the patient identity and clinical data to avoid any recall bias. The observers separately analyzed Gd-SWI, Gd-T1 SE, and Gd-T1 MTC and always evaluated the results in that order. The precontrast FLAIR sequence was always assessed to the interpretation to confirm the lesion features. Strict criteria were applied to designate a lesion as enhanced on Gd-SWI; all definite enhancing lesions were included (Fig 1), whereas areas of bright signal that were indistinguishable from flow artifacts or Gd-DTPA contrast within vessels or that did not have a comparable high signal on FLAIR were excluded. Axial fluid-attenuated inversion recovery sequence (A), axial T1 MTC pre- and postcontrast (B and C), and axial Gd-SWI sequence (D). A definitive acute demyelinating lesion requires the demonstration of a Gd-enhancing lesion along with high signal in the fluid-sensitive sequences, as shown in the left subcortical white matter temporal gyrus lesion (arrows). Note a small ovoid high-signal lesion on a FLAIR sequence adjacent to the aforementioned lesion, which demonstrates BBB dysfunction that is only characterized by the Gd-SWI sequence (arrowheads). The readers were asked to separate Gd-enhancing lesions according to their location in subcortical/juxtacortical, periventricular, or infratentorial (posterior fossa) areas, and the Gd-enhancing pattern was determined to be nodular, annular, punctate, or tumefactive.19 Similarly, we separately performed a comparative analysis of the interpretation of both Gd-T1 SE and Gd-T1 MTC to search for either a similar Gd enhancement in SWI lesions or a Gd-SWI acquisition that was negative for the presence of lesions enhancing in the other sequences. Statistical analysis was performed using the Statistical Package for the Social Sciences, Version 21 (IBM, Armonk, New York). Interrater agreement for Gd enhancement among postcontrast sequences was assessed with the Cohen κ coefficient. Agreement was graded according to the Altman definition with 0.0–0.20, poor; 0.21–0.40, fair; 0.41–0.60, moderate; 0.61–0.80, good; and 0.81–1.00, very good. According to the current design, the sensitivity, specificity, positive predictive value, and negative predictive value were calculated for Gd-T1 SE and Gd-SWI sequences to depict active demyelinating lesion–detectability performance. According to the defined criteria, a total of 170 examinations were included in this cohort. The study population included 103 patients with relapsing-remitting MS (76 women; mean age, 36.4 ± 11.6 years; range, 16–63 years). A total of 15,756 white matter lesions (range, 2–400 lesions per patient) were detected with a FLAIR sequence. The Gd-T1 MTC sequence showed the highest number of lesions with Gd enhancement with 282 lesions, followed by Gd-SWI with 265 lesions, and finally, Gd-T1 SE with 183 lesions. The spatial distribution and morphology of the Gd-enhancing lesions are shown in Table 1. Very good interrater agreement was observed for Gd-enhancing lesion detection between the Gd-SWI and Gd-T1 MTC sequences (κ coefficient = 0.86). Although 46 lesions were erroneously interpreted as negative for Gd-enhancement, 29 lesions were only demonstrated in the SWI sequence. Although moderate interrater agreement was observed between Gd-T1 SE and Gd-T1 MTC (κ coefficient = 0.78), 100 lesions were missed by the SE acquisition. If one assumes that Gd-T1 MTC was the criterion standard sequence, the Gd-SWI and Gd-T1 SE frequency characteristics in this cohort are demonstrated in Table 2. When the Gd-T1 SE and Gd-SWI sequence results were compared, we observed that 82 more lesions were detected by the SWI acquisition, which resulted in a sensitivity increase of approximately 29.7%. Considering the different lesion morphologies, larger lesions (>2.0 cm) had the highest agreement rate (99.3%). Conversely, punctate lesions demonstrated a lower agreement, but there was still a substantial concordance rate (91.0%) among all the post-Gd sequences that were analyzed. Gd-based contrast agents used in conjunction with MR imaging have been approved by regulatory agencies around the world. Several studies have shown their efficacy for improving the accuracy of MR imaging studies, and they currently have a positive cumulative safety record.28 Nevertheless, concerns have arisen about the long-term health effects of repeat Gd administration in patients with MS and the incomplete characterization of the MS lesion pathophysiology that results from relying on contrast-enhancement characteristics alone. Investigations have shown evidence of Gd deposition within the human brain after multiple Gd contrast administrations, especially in the dentate nucleus and globus pallidus, particularly when linear compounds are used.29 Thus, the National Institutes of Health recommends that the necessity of Gd administration in specific clinical indications should be carefully re-evaluated given the uncertain long-term public health impact of the deposition of Gd within the brain,28 though the precise causal role, if any, that repeat Gd injections play in MS pathogenesis remains unknown. Promising alternatives in determining the MS neuroinflammation and excitotoxicity processes in vivo have been demonstrated. It has been documented in the literature and adopted by our institution that the T1 MTC using 1.5T equipment is the most sensitive sequence for the demonstration of a BBB disruption with inflammatory activity in MS.20⇓–22,31 Nevertheless, there have been some controversies in the literature on this subject, and the lack of consistency among these methods for different MR imaging scanners is the main debate. Potential sequences that also require Gd-based contrast that have been recently reported in the literature are the double inversion recovery32 and T1 3D MPRAGE.33 Nonetheless, some investigations have also evaluated the accuracy of noncontrast MR imaging to confidently detect acute MS plaques.34 Diffusion tensor imaging, particularly through the fractional anisotropy metric,35 and, more recently, analysis of quantitative susceptibility mapping36 have been demonstrated to have high diagnostic accuracy for distinguishing enhancing from nonenhancing MS plaque activity in the absence of Gd administration. It is also worth mentioning sequences that label antibodies targeting surface markers of immune cells in preclinical studies.37 These imaging biomarkers may also have additional benefits for providing insight into the MS pathobiology that is not possible due to the simple dichotomous characterization of the presence or absence of contrast enhancement, and which could increase the accuracy of MS diagnosis, improve disease prognostication, and provide a more robust marker of treatment response. In certain settings, the T1-relaxivity may dominate and the T1-shinethrough phenomenon may arise, such as the effects that occur in the cerebral venous sinuses after Gd administration, which typically measure a few centimeters in diameter.18 Through this principle, the evaluation of Gd leakage due to dysfunction of the BBB has been exploited with some benefits and promising results in several situations, especially in the field of neuro-oncologic imaging,41 as well as in the evaluation of inflammatory disorders, as shown in this study for MS inflammation–activity detection. Our results support the use of the post-Gd SWI sequence in assessing inflammatory activity in patients with MS (Fig 2) and show that pre- and post-Gd SWI demonstrate a diagnostic accuracy similar to that of the adopted criterion standard sequence for this purpose and higher than that of the T1 SE sequence, with excellent agreement among the observers in our cohort. MR imaging detection of active plaques in 4 different patients with MS. Axial fluid-attenuated inversion recovery sequences (A, E, I, M, and Q), axial Gd-T1 SE sequences (B, F, J, N, and R), axial Gd-SWI sequences (C, G, K, O, and T), T1 Gd-T1 MTC sequences (D, H, L, P, and S), and a sagittal reformatting Gd-SWI sequence (U). Patient 1 demonstrates an acute juxtacortical/cortical demyelinating lesion in the right precuneus with Gd enhancement in all sequences (orange arrows in A–D). Patient 2 demonstrates an acute demyelinating plaque on the left corona radiata (E–F). Gd-SWI depicts the central vein within the plaque (arrowhead in G), adding specificity in favor of the demyelinating substrate. Similar to the Gd-T1 SE and Gd-T1 MTC sequences, the Gd-SWI sequence is also able to demonstrate BBB dysfunction in small lesions (red arrows in I–L). Patient 3 shows an acute demyelinating plaque on the subcortical white matter of the left postcentral gyrus that is only characterized by the Gd-SWI sequence (blue arrows in M–P). Patient 4 has a venous developmental anomaly in the left semiovale center, surrounded by a parenchymal hyperintensity on a FLAIR sequence (Q). Both the Gd-T1 MTC and Gd-SWI sequences (S and T) demonstrate a faint enhancement (arrow in T), which is elegantly demonstrated by the sagittal reformatting Gd-SWI sequence (arrow in U). Despite the large number of lesions analyzed, this report has several limitations because it was a single-center retrospective study with a relatively small number of patients without pathologic correlation. Although the visibility of the deep veins was slightly better with the 3T scanner, El-Koussy et al18 demonstrated similar sensitivity in comparing 1.5T with 3T scanners. Despite the possibility that the order of the postcontrast sequences could represent a potential limiting bias because the Gd-SWI sequence was acquired first, this reinforces its use as a marker of BBB dysfunction. The use of this new application of the SWI technique requires further study to be incorporated into clinical practice, as well as to implement and standardize the acquisition and interpretation of the results in the context of MS. This study confirmed that the Gd-SWI sequence increased the accuracy of detection of MS-typical contrast-enhancing lesions, including all of their locations and morphologies, similar to Gd-T1 MTC and better than Gd-T1 SE. This new application might add to current knowledge, revealing novel findings of the SWI sequence that are not currently envisioned to have a potential use for clinical practice. Because this study was performed on a 1.5T MR imaging scanner, evaluation of the performance of this sequence at 3T would be of interest. L.L.F.A was supported by Coordenação de Aperfeiçoamento de Pessoal de Nível Superior (CAPES), which partially supported this research. Accepted after revision January 24, 2019.